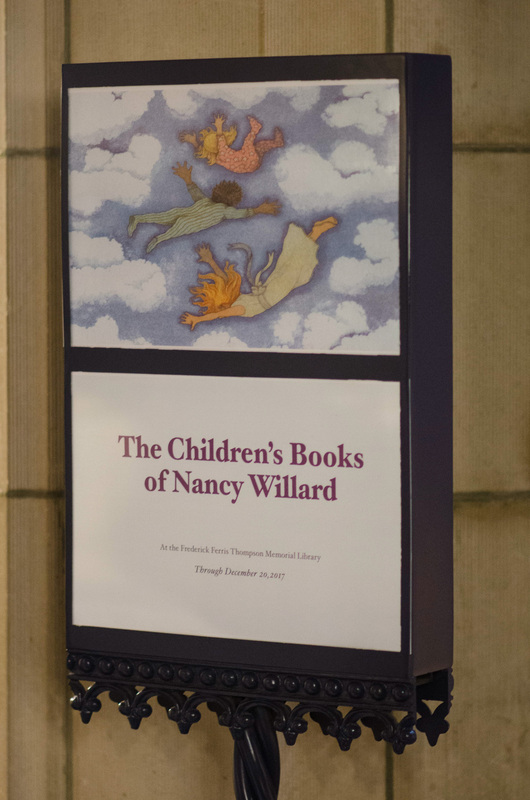 At Vassar’s Thompson Memorial Library, there is currently an exhibit displaying a collection of children’s books by the late Nancy Willard, who, along with being a faculty member at Vassar for almost half a century, was also a prolific author. 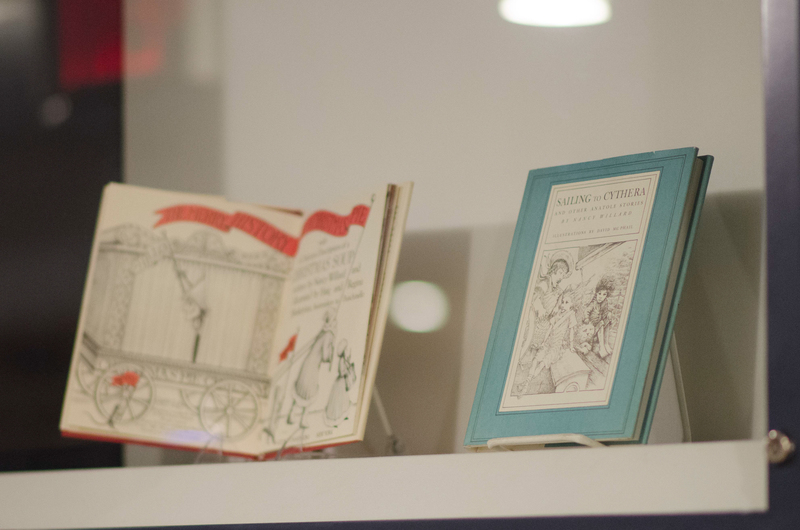 She wrote children’s books, poetry, and novels, and a selection of these popular books are now commemorated in this exhibition. The collection of Willard’s books spans decades and hints at the author’s tireless work ethic behind the books. In conjunction with a memorial service held previously following her passing, this exhibit serves as an open memorial for one of Vassar’s central community members. Willard retired in 2013 but had been teaching on campus since 1965. She died in February of this year, a grave loss for Vassar and the generations of students she instructed. This exhibit, planned before Willard’s passing, is not just a showcase of some of her works, but it is also a testament to how the community here at Vassar engages with itself through both remembrance of a person and through exploration of the works they left behind. Willard reached international acclaim and popularity with her breakthrough book “A Visit to William Blake’s Inn,” which won the Newbery Medal in 1982. 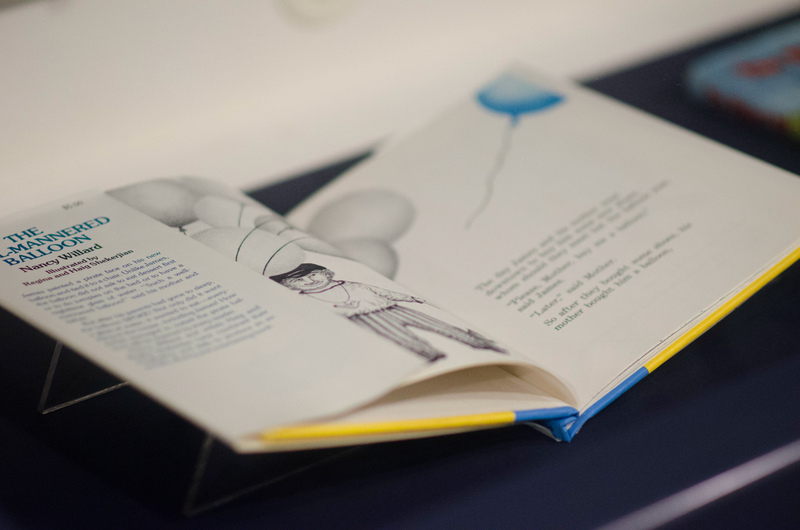 This book, which is on display in the library, transposes Poet Wil- liamBlake’s “Songs of Innocence and Experience” into a form for children. This is not to say that the book dumbs down any of the themes brought up by Blake; Willard deftly parses the works of Blake into a form that preserves the fantastical quality of his works without getting bogged down in details. This is to say that Willard shed new light on one of England’s foremost figures. Additionally, the works on display illustrate the theme of Nancy Willard’s role as both a teacher and artist. The exhibition style is a very understated one: The books rest two to a case, with one opened and one closed. There are no plaques or descriptions accompanying the books, just the books themselves. It would be very easy to walk past these without stopping to notice them. Director of the Wimpfheimer Nursery School and one of the coordinators of the exhibit Julie Reiss stated, “The exhibit is a way to show the depth and breadth of Nancy’s work in children’s literature.” This is an easy fact to notice upon closer examination of the display. They are not chosen at random but rather display an individual’s oeuvre over a span of decades that covers everything from John Milton to a flying bed and everything in between. It’s also significant to note the statement made by this unobtrusiveness: There is no argument to be made for these books’ place in the library because their place is a plain fact. We as students get the sense that the library is a building where only books of high academic esteem are on display, where books have to have some sort of justification for being part of Vassar’s collection. This exhibit pushes against this idea, asserting that all books, no matter their content, have a place in a library. In a previous interview conducted with The Miscellany News in April of 1990, Nancy Willard said, “Children are out there, and they read books many times and pass them on to siblings.” The same logic to applies to students and the library here on campus; we read books and pass them onto the next person. It’s a process that has no need for distinctions based on the quality or degree of the art. The beauty of literature isn’t that some books are better than others, which is why there isn’t just one supreme book of Willard’s on display, but that we all read books as a community and pass what we glean from them onto one another. The Associate Director of the library’s Special Collections and another coordinator of the exhibit Ronald Patkus made this claim about the exhibit quite succinctly: “Although [these books are] children’s literature, they are still literature.” But what this exhibit also illuminates beyond the value of books of all kinds is the intimate connections between Vassar’s library, the community on campus and the books that happily give life to this community. What makes this collection special is how much is not on display, and in this sense, the exhibit serves as an effective memorial. This exhibit is understated and sparse. This is not because of a lack of works to exhibit, but because the exhibit aims to mirror the person that the campus so dearly misses. And the books on display aren’t on display because they best represent the departed, but because they were her most well-known works. Nancy Willard’s literary career impacted everyone around her and influenced their perceptions of the writer. Her husband Eric Lindbloom said in an interview with The Miscellany News, “I always thought of her as a poet.” And yet there is no poetry on display in this exhibit, only the children’s books. This is something that is critical about the exhibit: The Nancy Willard on display here is an incomplete image. The visitors only sees a slim percentage of the works of this person, and thus of the person herself. It is on us to discover who this person was and the imprint she left on this campus. None of the students currently on campus were around when Willard was a professor here, but just by being a member of the community, students have the opportunity to discover such a magical figure. And through this discovery, we can see a little bit more of how this person rubbed off onto the campus at large. Every person interviewed for this article agreed that Willard was a “magical” person. The absence on display in the exhibit mirrors the absence of this magic felt by the campus. And it is through this sense of absence that the community can rediscover Nancy Willard and her writings. We don’t see the rest of Willard’s works, but they are here at the library, waiting to be discovered. The exhibit isn’t just a collection of books, it’s an open doorway to both a rich body of work and to someone who made campus into what it is today. Nancy Willard played a crucial role in shaping generations of Vassar students, and this exhibition serves as a small way of saying thank you for her work for the community and beyond.